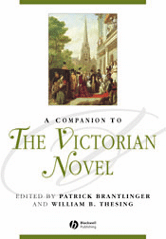 The Companion to the Victorian Novel provides contextual and critical information about the entire range of British fiction published between 1837 and 1901. Provides contextual and critical information about the entire range of British fiction published during the Victorian period. Explains issues such as Victorian religions, class structure, and Darwinism to those who are unfamiliar with them. Comprises original, accessible chapters written by renowned and emerging scholars in the field of Victorian studies. Ideal for students and researchers seeking up-to-the-minute coverage of contexts and trends, or as a starting point for a survey course.